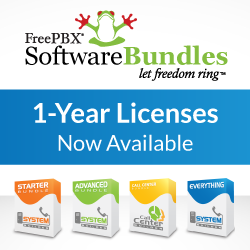 Press Release – FreePBX 2.3.0 Ships! the immediate release of FreePBX Version 2.3 at www.FreePBX.org. and powerful alternative to traditional enterprise voice solutions. services, and FreePBX Official Support. regardless of operating system or distribution channel. designed to match their needs. Atengo LLC is the primary sponsor and developer of FreePBX, the most popular open source PBX software solution. used by many open source telephony distributions such as Trixbox ® and Elastix. trademark of Atengo LLC. The Atengo logo is a trademark of Atengo, LLC. Trixbox is a registered trademark of Fonality.